I just thought I would drop you a line and let you know how Ivan is doing. First of all, I want to thank you and Austin Boxer Rescue for allowing me to have Ivan be a part of my life. I could not have picked a better boxer. Ivan is so wonderful. He is the most loving, gentle dog I have ever had. He is wonderful with the kids. 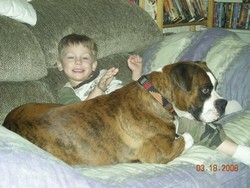 He love Levi the most, he chases him around the house and the back yard. He loves to play tug-of-war with Levi too. He is doing wonderful here. I have attached some pictures for you. I hope you enjoy them. I have been working really hard with Ivan and he is learning new things everyday. Again, thank you so much..